Mother of Sandi, Sam, and Chris Griffin, and the wife of Tom Griffin. Her husband is said to be unhappy with the marriage in "The Daria Database"; "Gifted" shows she believes she has control over what Sandi is up to, but Sandi is able to sneak around her back. According to "Database", she is 43, VP of Marketing for KSBC and had a brief career as a news anchor twenty years ago, with an interview of Rosalynn Carter the highpoint. She won't stop talking about this news anchor career. Linda and Helen Morgendorffer have an ongoing rivalry over which one has the better job and children, though they are "pleasant" to each other on the surface; the relationship is near identical to Sandi's with Quinn Morgendorffer. Linda heads the Lawndale Businesswomen's Forum, which Helen is a member of. In "Fair Enough", she is visibly happy to see Quinn be humiliated in public after she beat Sandi in drama auditions. In a flashback in "Daria Dance Party", she told a younger Sandi never to volunteer. When Sandi's attempts at volunteering went disastrously wrong, Linda actually looked smug about it - despite Sandi's distress and Sam & Chris destroying Sandi's decorations. Fandom is not generally sympathetic to Linda Griffin, laying the blame for Sandi's worst behaviors squarely at her mother's feet. 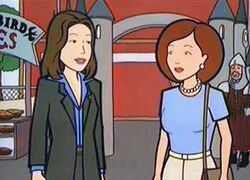 Such a portrayal does have canon support, as Linda was shown berating Sandi for volunteering and thereby laying herself open to exploitation in a flashback in "Daria Dance Party". Typical of the genre is The Angst Guy's "Winter in Hell." One notable exception to this image is in Doggieboy's ongoing work "Apocalyptic Daria." In this fic, we see a Linda who is vulnerable, afraid, willing to make unpleasant decisions, yet unbeaten and still able to show compassion. At present, this is possibly the single most sympathetic depiction of Linda Griffin yet portrayed in Daria fanfic. This page was last edited on 11 August 2017, at 21:04.